Welcome to my Christmas Recipe Countdown, where each day leading up to Christmas, I will be sharing recipes from some of my Friday Foodies, as well as a few from myself. Be prepared for healthy, mouth watering recipes that will help you to cater for all your festive season parties, dinners and get togethers. Each recipe is gluten, dairy and refined sugar free. On day 14 of my countdown, I am featuring Chocolate Christmas Panforte from Alice Nicholls of The Whole Daily. That’s why I’ve created what I am now describing as panforte-mageddon, because I actually ate this whole mutha-ucking panforteto myself today. I realise that when I’m tired, which I am right now, and when I feel a little anxious… which I do right now, I comfort eat. It’s not about the food all the time and more about what we are eating to cover up how we really feel. Today I ate to cover fatigue and anxiety. Do you ever do this? It’s typically an unconscious action but is so powerful when you can recognise it in yourself. Look… was it the BEST thing I could do to eat this whole panforte? Probably not, but it wasn’t bad for me because you see, it is created with 100% healthy ingredients and tastes flippin’ amazing. I had never made a panforte before and so when I took that first bite I was dying I tell you, D Y I N G.
I was alone in the kitchen and I was looking around me desperate for someone to witness the coming of the panforte-mageddon and no one was. The crunch of the dried goji berries are almost like hard candy within this rich chocolate treat when eaten frozen. 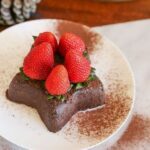 Alice was my Friday Foodie back in June, where she shared her Raw Vegan Chocolate Tahini Slice recipe. Mix all ingredients together and place into a cake tin lined with cling-wrap or lined in baking paper. Freeze for 1 hour and then remove from the mould and allow to ‘un-freeze’ (is that even a word?) slightly before slicing. If you want to gift this you can wrap it in baking paper and tie with a pretty red ribbon before handing it over to the lucky person. Make sure they keep it in the fridge if you’re in the Southern Hemisphere because the Aussie summer will make for a very melted panforte-maggedon. Alice Nicholls is The Healthy and Wealthy Specialist. Because she believes that when women feel healthy and empowered the world will shift for the better, she creates digital products that support women with tools to change the world. Her eCourses, books and programs are valuable, beautiful and effective. She is also a terrible dancer.